Note: This is the bound book only and does not include access to the Enhanced Pearson eText. To order the Enhanced Pearson eText packaged with a bound book, use ISBN 0134675444. 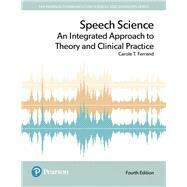 Speech Science: An Integrated Approach to Theory and Clinical Practice, 4th Edition focuses on the relationship between the scientific study of speech production and perception and the application of the material to the effective evaluation and treatment of communication disorders. Theoretical material is presented first, followed by clinical application chapters highlighting specific disorders. The organization of chapters in the new edition now more closely follows the speech subsystems approach, beginning with basic acoustics, and moving on to the respiratory system, phonatory system, articulatory/resonatory system, auditory system, and nervous system. As in previous editions, the book concludes with information on classic and current models and theories of speech production and perception. New and revised full color illustrations and larger spectrograms supplement the concepts presented by clearly depicting scientific and anatomical material and ensuring understanding of the links between the underlying science and human communicative behavior. Dr. Carole Ferrand earned her BA in English at the University of the Witwatersrand in Johannesburg, and her MS and PhD in Communication Sciences and Disorders from the Pennsylvania State University. She teaches undergraduate and graduate courses in speech science, and a graduate level course in Voice Disorders. Her research focuses on acoustic attributes of normal and disordered speech production. In addition to Speech Science: An Integrated Approach to Theory and Clinical Practice, she is the author of the textbook, Voice Disorders: Scope of Theory and Practice. When not writing books, Dr. Ferrand enjoys reading historical fiction, a capella singing, and playing banjo.